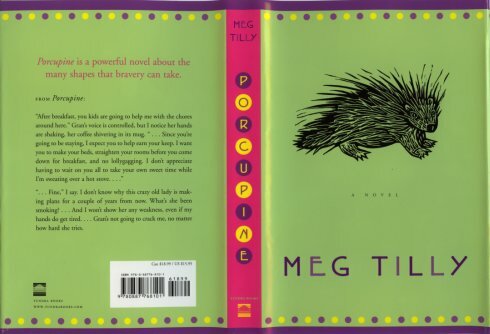 Once again, I am happy and excited to let you know about Meg's third book which she has titled "Porcupine". Unfortunately, I have only JUST received my copy, so I haven't had a chance to read it and provide my own opinions and comments. Stay tuned because I *will* read it and post my commentary soon! "Porcupine" will be different from her first two novels as this one is written for young adults. I find it interesting that Meg's stories have so far been centered around children and their viewpoints. I think that says something about the type of person she is, what she finds important in her lives - important enough to want to share with the world. As I've mentioned, I haven't read "Porcupine" myself, so can offer only general information taken from the book flap. Hopefully, it will be enough to hold you over and maybe entice you to get a copy for yourself. (From the book flap:) "War-torn Afghanistan could not seem farther from Newfoundland, but it is about to change twelve-year-old tomboy Jack Cooper (or Jacqueline, as her mother insists on calling her) forever. When her father is killed in the war, she watches helplessly as her mother crumbles under sorrow and depression. Jack and her younger sister and brother, Tessa and Simon, end up across the country, living on a run-down farm in a small town on the Prairies with a great-grandmother they didn’t know existed. Worried that they will be abandoned again if Gran moves into a retirement home, Jack puts on a brave face and encourages Tessa and Simon to take on the challenges of their new life. In the process, she learns that families come in many different forms and that love, trust, and faith can build a home anywhere." I had the honor and pleasure to be able to attend one of Meg's book reading appearances for "Gemma". I highly encourage anyone who has the opportunity to attend a reading - I promise you that you will not regret it. Meg is currently working on her fourth novel, another Young Adult story titled "Lucky". As soon as I learn something, I'll share it here on the site so check back for updates. Please contact me and let me know if you find anything more about Meg or her books that I can share. Thanks!